It has been far too long since I posted here - I am not dead yet! I have been working in a job that has allowed little time for blogging (not to mention anything else) but now I have a new position that leaves a little better work/life balance. I'll be posting some backlogged reviews soon. I have a number of new pencil related stuff to get out here and such. Anyhow, if you have been to my blog lately and wondered whether I fell off the face of the earth. Nope I am here. Drop me a note. Say hi. Troy at Classroom Friendly Supplies sent me a new pencil sharpener to review and my first impressions are very, very good. It has the feel of a metal napkin holder that you'd find in a 50's diner. It is also a bit heavier than I expected it to be. The first thing that I noticed when I tried sharpening a pencil in it was just how perfectly shaped the lead is. It struck me that this did a better job in seconds at sharpening than I can do with my KUM Automatic Long Point sharpener. So, I decided that this review would start off with the results of what happened when I put the two up against each other. The KUM sharpener I bought locally, at my favorite art supply store. Here is how I setup the competition. Each pencil sharpener will be used to sharpen one of my NOS (New Old Stock) Dixon Ticonderoga pencils in the Extra-Hard (2H) variety. These come from my own private reserve of these Made in the USA beauties. I am going to mark each pencil for which sharpener I am using on it and I will spending the next several hours working on an instructional design project. So I will need to use some serious pencils for that. I use pencils for all of my content sketches and object layout. I am thinking that this post will cover roughly1/3 of the use for each pencil. I plan to rotate each pencil in turn and sharpen them only once they are too dull for my tastes. 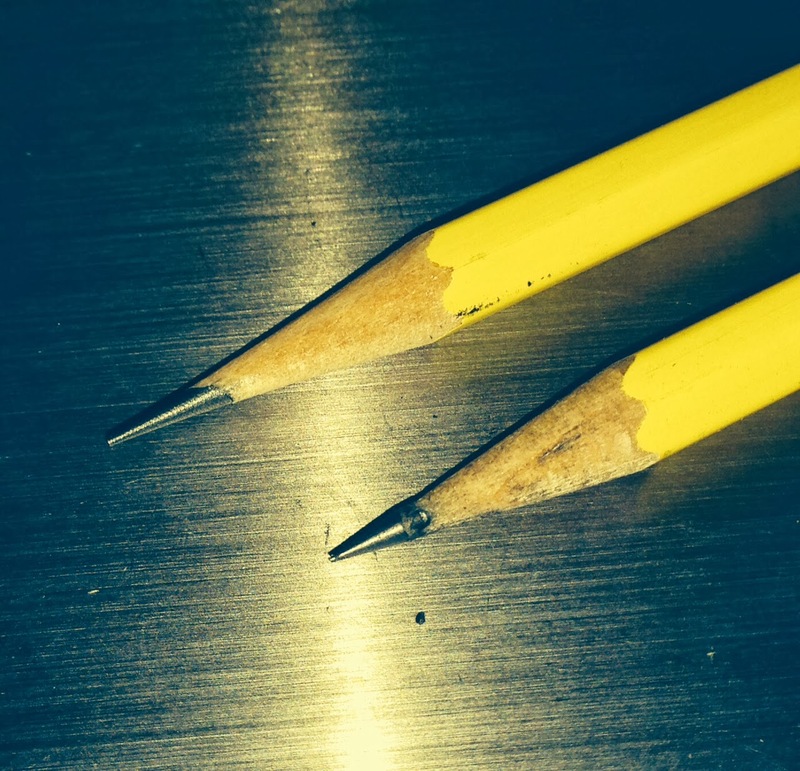 I like sharpening a pencil cause it gives me a moment to think between ideas. I'll be writing each segment of the post as rounds. Note: several hours of use happened between the rounds. Here are our contenders labeled and ready to go. KUM - 3 minutes and 38 seconds (in this time I sharpened twice because the lead broke during the second stage of the sharpener the first time). At first when the lead broke in the KUM on this first try I thought oh crap, I need to start over, then I realized that following through may show that the other sharpener breaks the occasional lead as well. Before I started this did occur to me as being possible and with that in mind I put a brand new blade in the phase two opening on the KUM. If you have ever used one of these guys you know that it is easy to break a lead from time to time. In addition, this is a 2H pencil so the lead is much firmer and (in my experience) more susceptible to breakage. The lead shown at the top in the image below is the Classroom Friendly one and the lower one is the KUM. The Classroom Friendly sharpened one has a smooth almost polished surface on the lead and I noticed that the point is actually slightly longer. The KUM also makes the wood on the pencil slightly dirty. Notes: I had been using the CF sharpened pencil for a little bit when I noticed that the sharpening seems to have a concave line to it. This is what gives it the very long point. I really like this and I think most "drafting" users would as well. The sharp narrow point reminded me of the lead for a mechanical pencil (yes I do own some mechanical pencils). 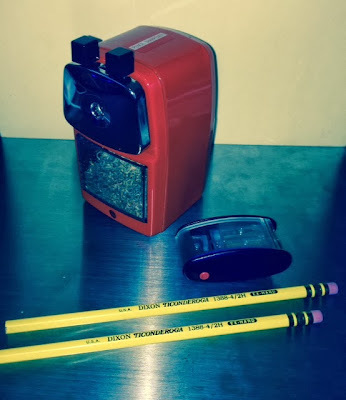 Over the course of using this pencil sharpener it occurred to me that this pencil was going to last forever. The Classroom Friendly Pencil Sharpener does not seem to remove any length from the pencil at all, the mechanism inside makes it to that the very end of the pencil tip as you dull it down becomes the very end of the pencil tip after it is sharpened. This is a great feature if you love premium pencils. No waste. Here you can see in the photo that after the same number of sharpenings and quite a bit of use it is clear that There is more of the CF pencil left. 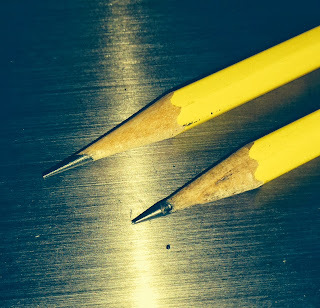 I know this is one of those subjective things so I grabbed a couple of my Palomino Blackwing 602's out of my drawer, sharpened one and left the other full length. Guess what? I found that they were exactly the same length still. The CF had not shortened the pencil whatsoever. Take a look at the comparison below. I do love the portability of the KUM sharpener and I think the ability to get the lead to a needle sharp point is great but the consistent tip that the CF sharpener leaves is unbeatable. It leaves a line about the same as a .05 mechanical pencil lead. Once it gets to about the .07 thickness is where I would sharpen it. Conclusions. This is not just a Classroom Friendly Sharpener it is a budget friendly one. The one thing that I do not like about it is the "teeth marks" it leaves on pencils. They are not quite like actual teeth marks as they are very small but they do build up as you use the CF more and more. They are not a deal-breaker for me. The first picture below is part of the picture above and you can see an example of the tooth marks on the Blackwing. The second shows the final state of both pencils along with an up close view of the teeth marks that build up over time. I think this is a great sharpener. Thank you Troy for sending this my way. I love that this thing was designed by a teacher for classroom use, small business and creativity is one of my favorite things. I will be buying one of these from him for a friend who is a 5th grade teacher, I am not going to give up this one on my desk. I had a fascinating meeting with Audie from edukit.com on Monday. She contacted me via the blog and come to find out it is a small world and we are both based out of Colorado Springs! If you are not familiar with them they are a company that builds school supply packs for parents that meet teacher specs. They are distinctive in their vertical in that they source premium products and meet some very demanding requests. It was interesting speaking with Audie who is responsible for buying lots and lots of pencils. Gained some new insights on what it means to buy small items in large quantities. Audie contacted me via the new request form on the site, see I don't ignore anyone! Thanks for the iced coffee Audie! 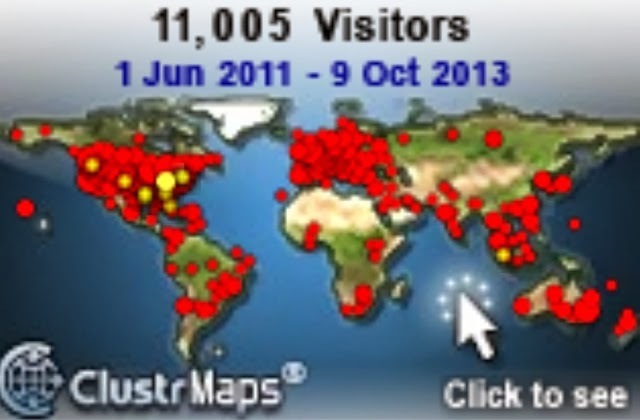 Just today I happened to take a peek at the blog counter. I passed the 11k mark! I looked into it and this little blog has been averaging over 600 visits per month! Pretty amazing for a little site that I don't even post on very regularly. Thank you for reading my rambles about pencil stuff. I have some exciting new posts in the hopper! 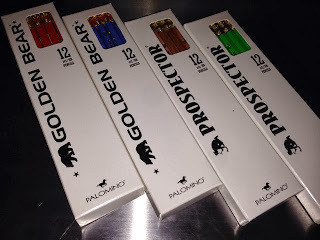 I am doing a side by side comparison of the Thailand made Golden Bears and the made in USA Golden Bears. Also I'm running the new Prospectors through their paces. Let me say this, so far I am impressed with these entry-level offerings from pencils.com. Thanks to Alex for the review pencils! Most of what you see here is vintage Dixon Ticonderoga. The large box is a complete unused half gross box. I have the original cello wrapper as well. This is my collection of more recent Dixon Ticonderoga pencils from the 80s and 90s made in USA. Also in this shot are the Mephisto pencils I reviewed previously. I'd really like to see more companies bring high-quality pencil making back to the US the way that Cal Cedar has. Note: a few of these boxes I will not tap into, I use most of these pencils.